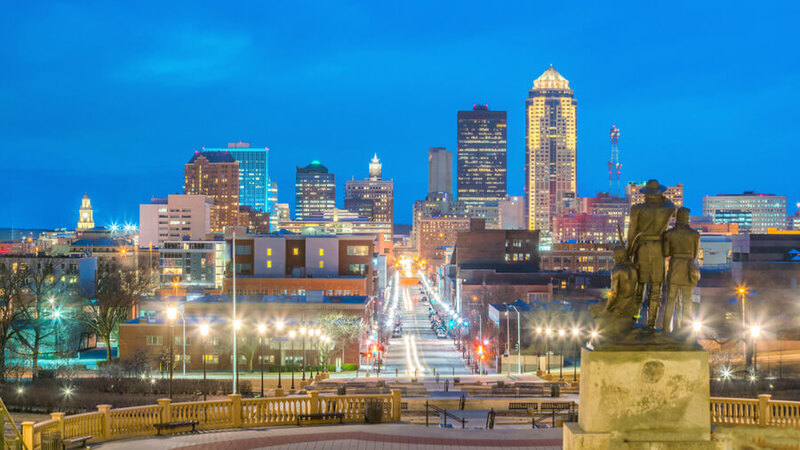 Bridges of Iowa, located in the capital city of Des Moines, Iowa, is a faith-based substance abuse treatment and rehabilitation center for adult men looking to overcome chemical dependency and substance addiction issues. The center, which also aims to reduce the number of persons going to prison for being addicts, was founded in August of 1999 by Don and Charlene Lamberti and has since helped hundreds of people in Iowa transform their lives. For more than 20 years, the organization has been focused on helping individuals who have been punished by the criminal justice system for minor drug-related crimes transition back into society as productive members of their communities. The facility’s main goal is to help these individuals get out of prison, help them achieve and maintain recovery, and teach them the tools they need to avoid repeating patterns of crime and substance abuse. The center emphasizes a non-punitive approach to addiction treatment and offers a wide range of substance abuse treatment services which are tailored to suit the needs of each patient and to help persons at any stage of addiction or substance abuse. Among the levels of care, the center offers transitional housing services, outpatient treatment, and employment services—which also incorporates career-readiness training and financial management. The center housed in the west wing of the county jail and can accommodate up to 40 men at a time. The residents are housed in simple, small, single rooms, with each having cabinets for personal items and double beds. The facility is quite spacious and is equipped with a fitness center, living room, offices, dining room, and a large kitchen. Residents may watch TV during leisure hours and may also engage in frequent recreational outings. The transitional living house offers apartment-style housing and is reserved for patients in the final phase of treatment. Four men can be accommodated in each unit with two bedrooms, bathrooms, living room, and kitchen. Meals are provided thrice a day and are usually healthy and nutritious—vegetable, fresh fruits, and snacks are available. The residential treatment program is long-term and offers individualized, evidence-based programs to persons suffering from substance abuse issues. Patients are encouraged to engage in healthy lifestyle habits as alternatives to substance addiction and community service. The transitional living program is designed for patients who have completed the residential treatment program and offers support to persons who need to transition back into society. Clients are taught how to apply the skills they have learned in the residential program and also given job placement and readiness training. The center offers outpatient treatment services designed for persons who need regular treatment, support, and check-ins but have the skills they need to function in their daily lives. Sessions occur 1-3 times weekly in the evening. Bridges of Iowa costs vary greatly depending on the type of treatment and level of care a client requires. On an average, it costs approximately $1,500 per year for treatment at the facility with insurance payment, and $34,000 per year for an out-of-pocket payment. These prices are subject to change. The facility is in-network with most major commercial insurance plans and is willing to work with out-of-network providers. Clients are advised to contact the facility for more information on payment, verification, admission, and more. The facility understands the importance of family involvement in treatment and in this, offers a family program called Spiritual Awareness and Family Education (S.A.F.E). This program is aimed at educating family members of clients, on creating an environment that promotes support and how to prevent relapse. Family members must attend at least three classes of the S.A.F.E program before being given visitation privileges. Clients who have completed a primary program are given a graduation ceremony, family, friends, and currently registered patients are invited to attend. This serves to give current clients support and motivation to complete the program. In entirety, the facility offers comprehensive, well structured, and well-rounded programs to fit the need of clients suffering from substance abuse and mental health disorders. The facility is dedicated to imbibing proper principles and valuable tools to help clients live a long life of sobriety. Clients seeking a facility that encourages clients to cultivate their spiritual lives and uses evidence-based practices for treatment will find Bridges of Iowa to be a good option.